The photos below were taken in natural light against a white poster-board background, using a cellphone camera, to create a rough side by side color (and size) reference for our chewables. One sample of each color is shown - for example, the mint UFO is the same color as mint dulcimer, mint bat, mint blossom, etc. Clockwise from top left: twilight purple blossom, amethyst annular, thistle mushroom, purple donut, purple feather, purple raccoon, lilac dulcimer, purple jellyfish, plum Kleintastic, garnet blossom. Clockwise from top left: Navy droplet, sapphire UFO, blue jellyfish, indigo Kleintastic, blue cloud, aqua dulcimer, arctic blue braid, blue macaron, blue snowflake; center: blue festher, teal bangle bracelet. Clockwise from top left: Azure braid, turquoise annular, mint mushroom, green macaron, mint UFO, green raccoon, lime green chew knight, neon green alien, emerald droplet. 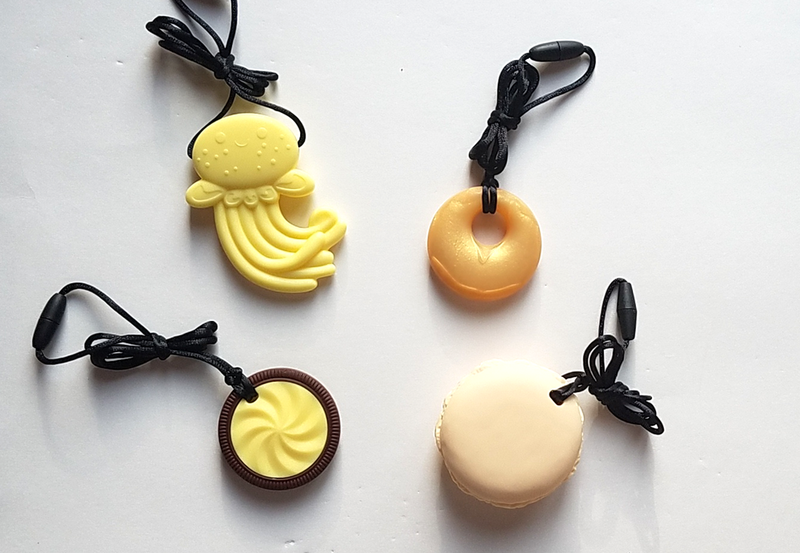 Clockwise from top left: Yellow jellyfish, gold annular, yellow macaron, lemon yellow cookie. From left: brown raccoon, brown bat, brown donut. From top left: Orange bat, orange cookie, mango blossom, peach feather. Clockwise from top left: Fuschia droplet, ruby UFO, pink jellyfish, pink droplet, pink raccoon, pink elephant, pink macaron, pink donut, coral blossom. From left: Claret dulcimer, scarlet annular, red chess queen, red Ch-U tube. From left: White snowflake, white feather. 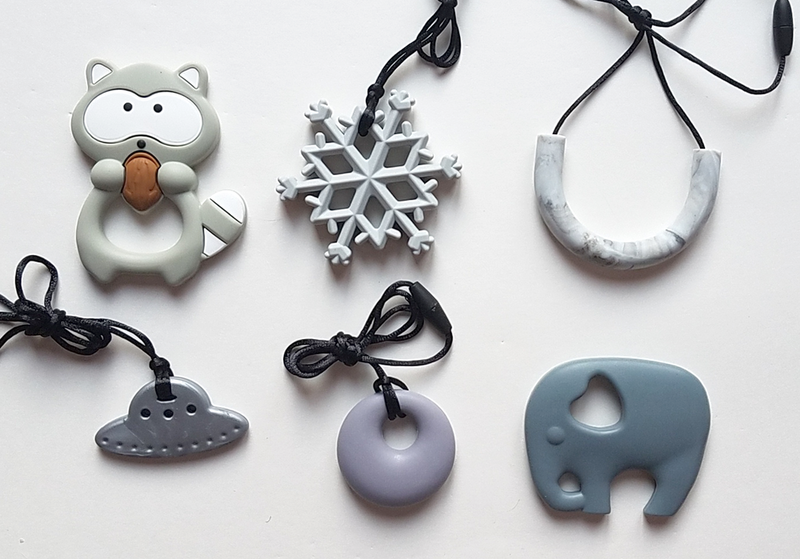 Clockwise from top left: Grey raccoon, grey snowflake, marble grey Ch-U tube, grey elephant, grey annular, silver UFO. 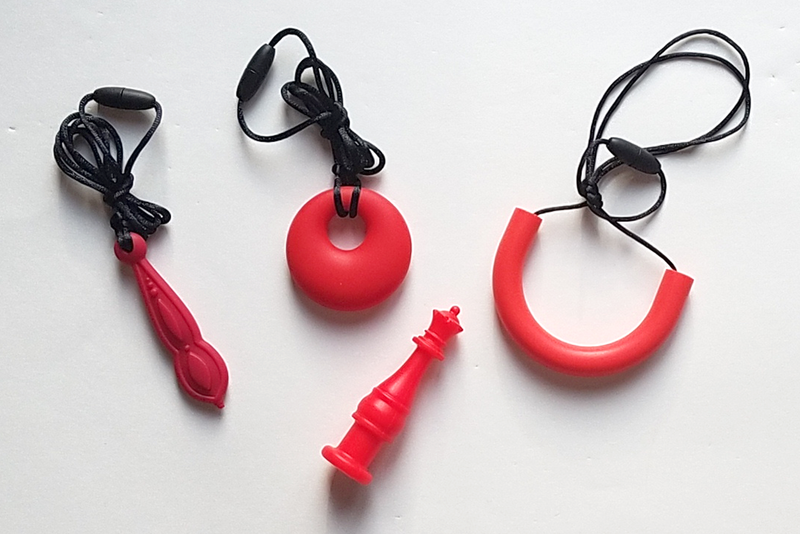 Stimtastic's chewable stim toys are made of the same food-grade silicone as our chewable jewelry. 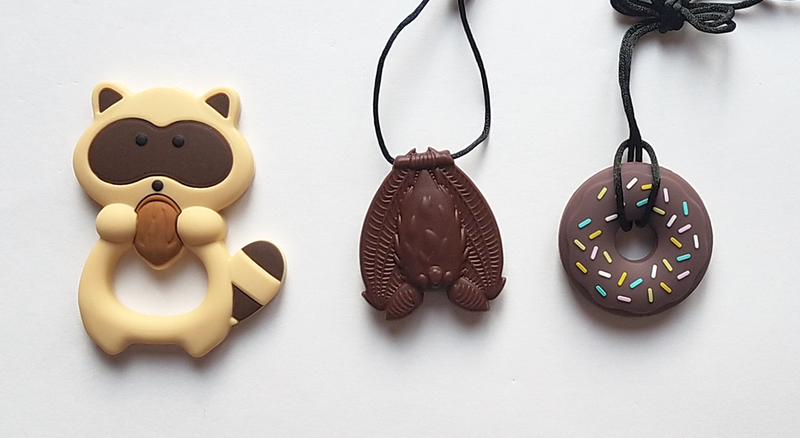 Each one is a unique mix of textures and shapes, making them fun tactile stim toys that are safe for chewing too. Handheld chewables are durable and flexible, which means they are suitable for light, moderate and moderately aggressive chewers. Each handheld chewable has at least one cutout, making it easy to attach to a lanyard or cord for safekeeping. Most are also small enough to be tucked into a pocket. Whether you keep your chewable stowed in your bag or use it as a fun desk accessory, you'll be comforted by knowing that it's never far away when you need it.